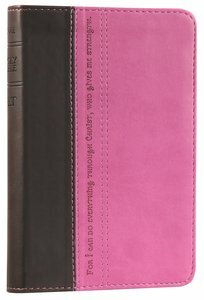 About "NLT Compact Bible Pink/Brown (Black Letter Edition)"
A text-only Bible with presentation page, ribbon marker, and gilded page edges. Conveniently portable at just 16.6 x 11.6 cm, and only 2.4 cm thick! :No matter what challenge you face, the ?I Can? edition Bible will encourage you to draw on Christ's strength for victory and never give up. Available in this compact edition that you can take wherever you go, easily fitting into a purse, backpack, or briefcase, the ?I Can? edition features the life-changing New Living Translation text plus 25 pages of Bible helps up front. The New Living Translation breathes life into even the most difficult-to-understand Bible passages?but even more powerful are stories of how people's lives are changing as the words speak directly to their hearts.